Hi my friends. I hope everyone is fine and well. Hands up, how many of you remember peg stamps when they first came out? I have a couple of sets, which were pushed aside and forgotten. However, there are some 'new kids on the block' called, Majestix, and they are clear stamps and the pegs are acrylic (you buy these separately, just like ordinary clear stamps and blocks (the old ones were red rubber on wooden dowels. 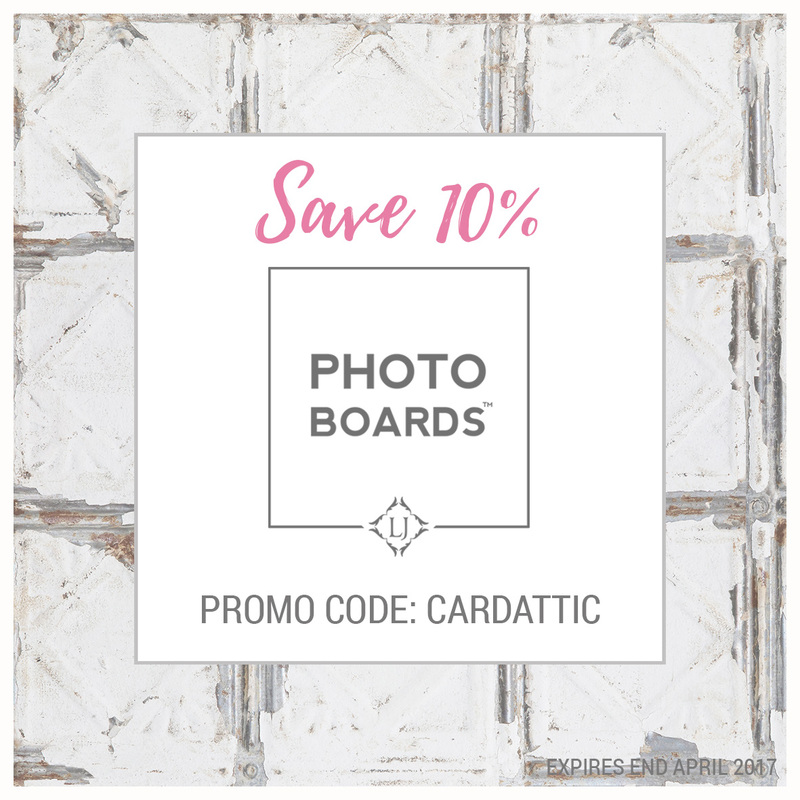 What I loved/love about these tiny stamps is the sheer amount of different 'arrangements' you can get from just one tiny set of images and they are made to go together easily. Some of the sets only have four images and others, up to eight, depending on what set you get. 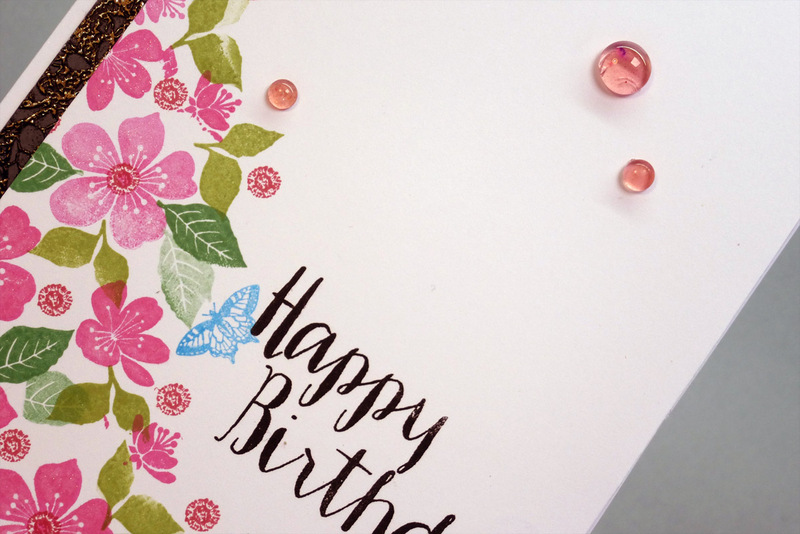 Another plus, is that as they are so very small, you don't have to be too fussy about your stamping - that's not to say that you can be sloppy - but if you make some errors, half-stamped images, little smudges here or there . . . it just isn't that noticeable! You can see my mistakes in the detail shots below, but in real life, they are really only noticeable to us crafters! 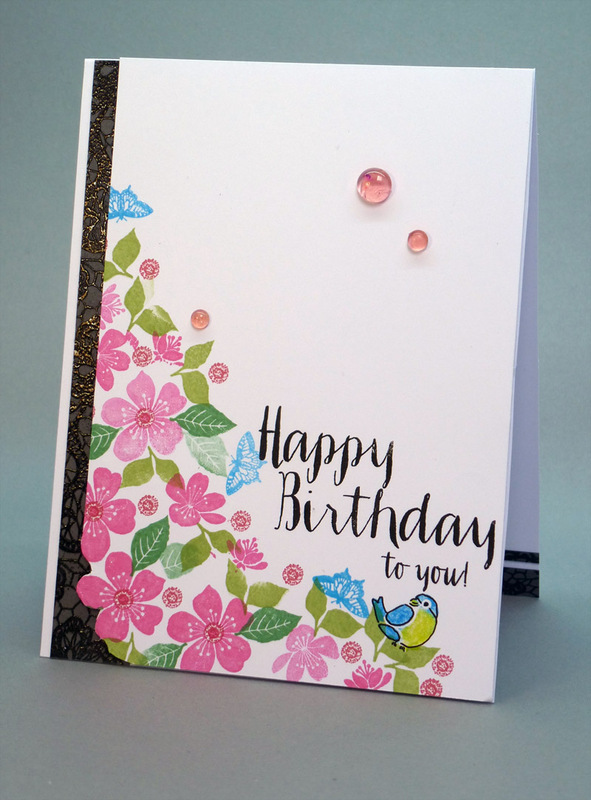 For my card here, I used the 'Sakura Blooms' set of images and a tiny butterfly from the 'Anemone Garden', and a sweet little bird from the 'Bullfinches and Blooms' set and went around him with a fine liner, as he was a little 'lost' amongst all that foliage! Next, I stamped my sentiment and heat embossed in clear embossing powder a piece of grey card-stock that I had stamped the My Favorite Things, 'Lace' background stamp on, for a little texture. The grey looks really dark in the pictures, but in fact it is more of a mid grey! I adhered that down to a white card base, leaving a small strip of white to the left. Then, I fussy cut the corner and mounted the stamped panel up on foam tape for a little dimension. I finished the whole look with some more of my home made dew drops (more on that after the rest of the pictures, so those of you in a hurry are able to get off). 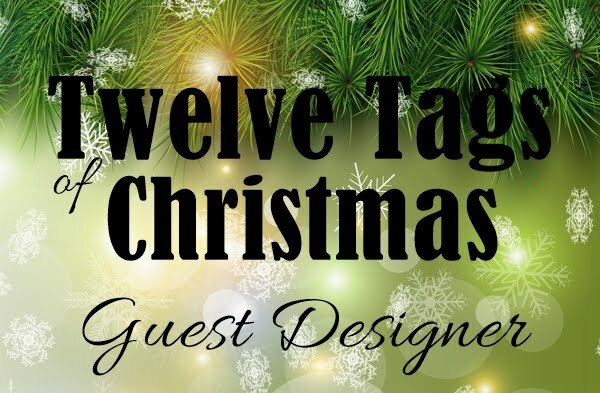 Here is the card! Right, for those of you still with me . . . WOW, you are tenacious, thank you! The dew drops. I wanted to experiment with getting different colours of dew drops, so these were 'tinted' with some Brusho powder in Rose Red. When I melted the WOW 'Melt It' powder, I sprinkled some Brusho into the melted powder. However, it took an awful lot of time before it mixed in, so, the next time I'm going to try mixing some Brusho powder in with the 'Melt It' powder whilst it is dry (I think I should have done that this time, but hindsight is always 20/20). So many of you have been asking about my dew drops, so here, for those who would like to know is how I made them! Put a peg/clothes pin on the rim to hold the container - it will get very hot - or you can do what I did and just use your reverse tweezers, and pinch the opposite side of the rim to make a little pouring spout. Get your heat gun and heat the Melt It powder from the bottom (or, if you like the dusting you see on cakes, from the top, like I tried once - I'm still dusting off all surfaces), it melts quite quickly, depending on how much you use of course. Then, when it's all turned to liquid start dripping it out on to a craft mat/cooking sheet (I found that the quicker you drip the more chance of getting perfectly round ones). Don't worry about the misshapen ones, because they set very quickly, so you just pick up the misshapes and put them back into the container and remelt, and pour again, and you keep doing that until it's all used up and you have a load of beautiful dew drops. Try experimenting with different colouring mediums, here I have tried some Brusho powder mixed in with the melted powder, but it took ages to mix, so next time I'm going to try mixing in some Brusho in to the powder before melting it and see how that goes. I have also tried mixing in some embossing glitter from WOW and that worked well too! Let me know if you have had a go and how you got on, I'd love to hear about your experiments and results! Have a wonderful weekend of new discoveries my friends! What a pretty arrangement! I like how you used that tiny circle as a stand alone flower and a flower center. 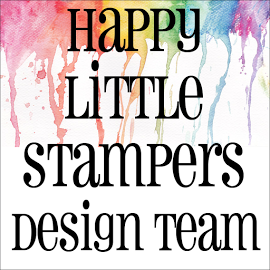 I do love the peg stamps, even though I was not stamping when they first came out, I do think they are lots of fun. I have seen the majestix on Pinterest, but have not seen them available in the US. Wow such a great card here Hazel! oh oh do I need those stamps now though? ?lol.....and the dewdrops, they caught my eye straight away. darling card with all the little flowers and your little bird in the corner is so cute - have a wonderful weekend! Loving all those little stamps. Such pretty colours. Fabulous the fussy cutting in the corner and the lost delightful little bird, delicate and pretty card x Looking forward to result of the brusho's after it is dry! This is so pretty, Hazel. I have seen these stamp sets but not succumbed... yet!!! My hand is up - can you see it? I have plenty of peg stamps collecting dust here! Thanks for showing me how to make a gorgeous card with them! 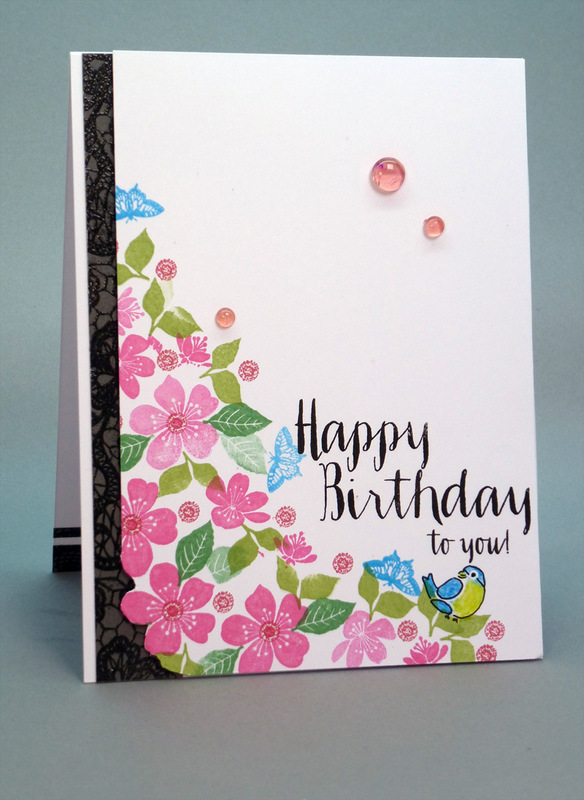 The pink flowers are lovely with the butterflies and the wee bird! Very pretty Hazel and I love that grey border, looks so distinguished. 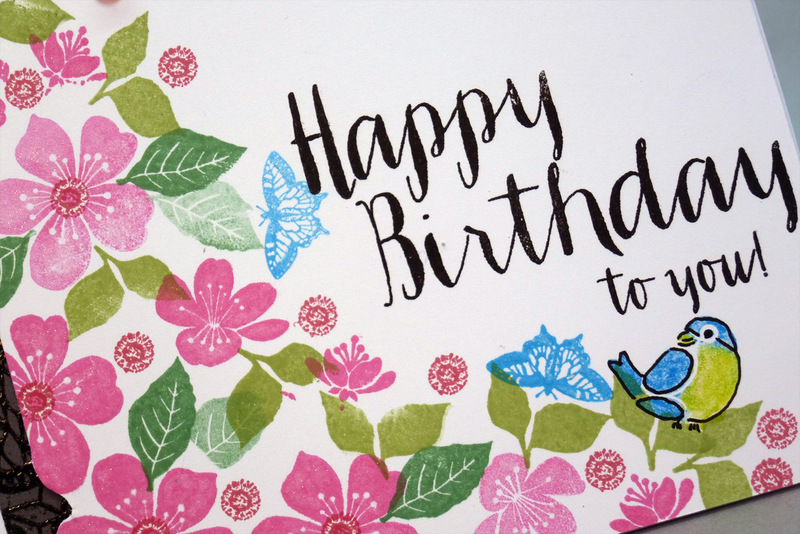 Your card is so pretty, Hazel! I love your little dew drops. Do you use a heat gun to melt the Melt It! powder? How do you get them so perfectly round? Sorry for asking so many questions - I'm just intrigued. Oh, this is so beautiful, Hazel!!!! Love all the sweet little pink flowers and the pretty butterflies and the little bird is just soooooo cute!!!! Your coloured dew drops look amazing!!! Lovely, my friend!!!! It's a gorgeous card Hazel and I enjoyed reading all about it. All the extra things you did make your card look extra special. I am going to have to dig out my old lace stamps after seeing what you did with that lovely grey border. 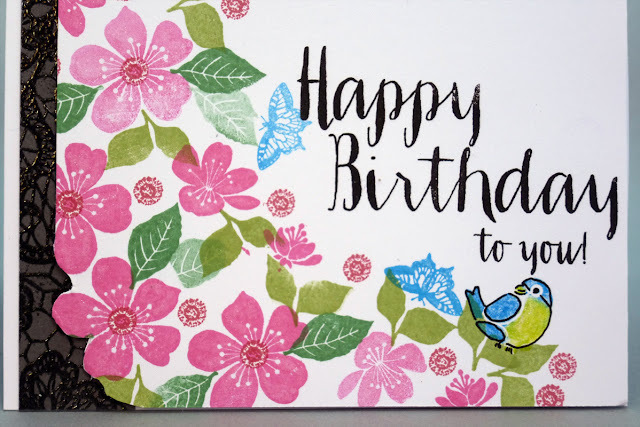 I like how you have cut round the bottom of the card and drawing round the little bird makes him a great focal point. This is a gorgeous card Hazel, love the wonderful image you have created with the tiny stamps and those dew drops are fab ! Good grief woman! Is there no end to your talents? Home made dew drops? Well I never! 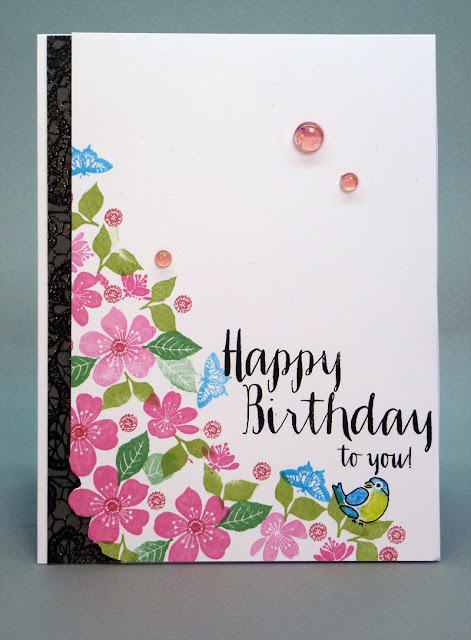 Very pretty card using your sweet floral stamps teamed with the contrasting sentiment and side strip. Love this little corner flower garden you've made! Love the dew drops too! Absolutely gorgeous card! I have one peg stamp. Can not get rid of it but do not use it much.